I don’t know about you, but I’m ready for a little rest and relaxation in a nice secluded sunny patch. Of course, we’re going to need a comfy piece of furniture and some relaxed clothing to make that happen. So, let’s get started. First stop, Gimme Gacha’s Imaginarium event. Most of the designers at the event have set out a free gift for members of Gimme Gacha’s group. The group is free to join, so you’re bound to leave with a load of fun freebies. Our model’s hair, hair jewelry, eye makeup, slippers, and the large comfy chair can all be found at Imaginarium. Pop over to Coco Design to pick up this cropped tank. It comes in two shades, black and grey, and three sizes. Alphas are also included for classic avatars. Our last stop is Cremosas Store. 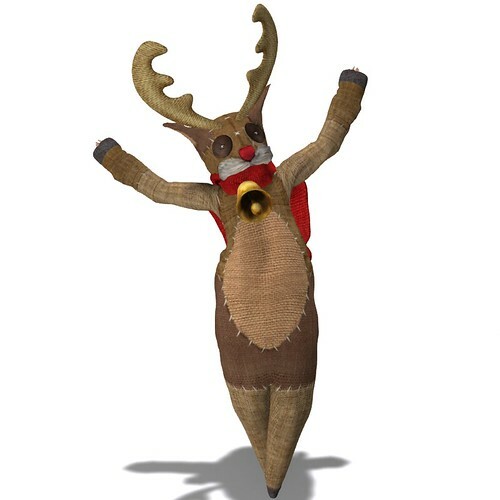 There are over 40 gifts just waiting to jump into your inventory. The Boho Skirt #140 is sized for Maitreya, Slink, and Belleza mesh bodies. Of course, this skirt is easy enough for classic avatars to wear when paired with a lower body apha. Until next time, shop happy! Ruffles, buttons, and bows oh my! Combine these two fantastic gifts from COCO DESIGNS and Cremosas Store to make an easy fast outfit from just two teleports. Both items are sized for mesh bodies. 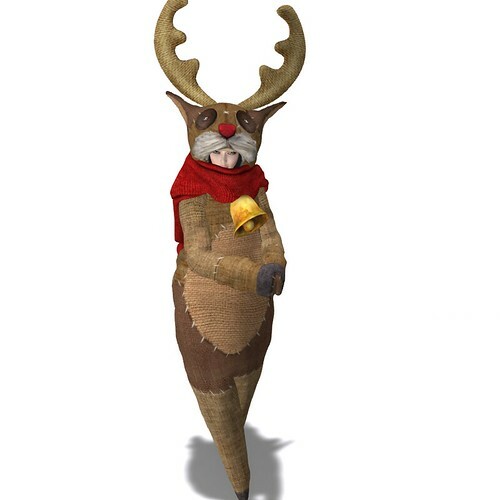 That said, it wouldn’t be that hard for classic avatars to pilfer a few alphas from their other items to make this outfit wearable. If you’ve got stomping on your mind, then you’d better run over to Gabriel’s booth at the Okinawa New Year’s Festival because you probably don’t have long to pick these babies up. The Geta boots are sized for Signature, Belleza, and Maitreya feet. 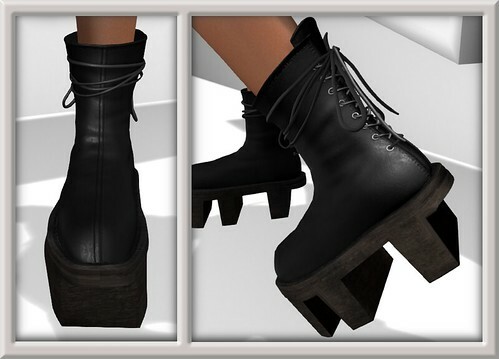 Another pair of unrigged boots is included in the box allowing resizing which easily makes these boots a unisex item. All of today’s accessories are group gifts at Rebellion. Not only is the group free to join, but the store also hosts 10 fast moving lucky boards. Visit EscalateD’s lucky board area to pickup this fun hairstyle. You’ll need to join EscalateD’s group to play the lucky boards. Currently the group is free to join, but during non-free join periods the cost is 250 Lindens. If you’re a fan of bold hairstyles this is definitely a group with a slot in your list. The last stop to complete this outfit is COCO DESIGNS. This classic scoop necked top is sized for mesh bodies. Simply join COCO’s free group and leave the store happy. Here’s a closeup of the Geta boots. They are wonderfully detailed, and perfect for getting your stomp on. Shop happy! Though there are still more red outfits that can be made from the offerings in Hilly Haalan & COCO DESIGNS’ gift areas, I’m going to end on a heart cutout ensemble perfect for Valentine’s Day. These supple suede boots are an older style mesh coming in 3 sizes: Large, Medium, and Small with an alpha. Though made with classic avatars in mind, mesh bodied avatars that have a detailed alpha system can wear them too. Until next time, shop happy! Happy Sunday! Today I’m having fun mixing and matching red gifts from COCO DESIGNS‘ group gift wall. The sleek body hugging tube dress I featured yesterday is a perfect mesh for layering. The addition of an over-sized sweater and glitter shoes transformed the dress into a perfect foundation layer for a stylishly casual outfit. 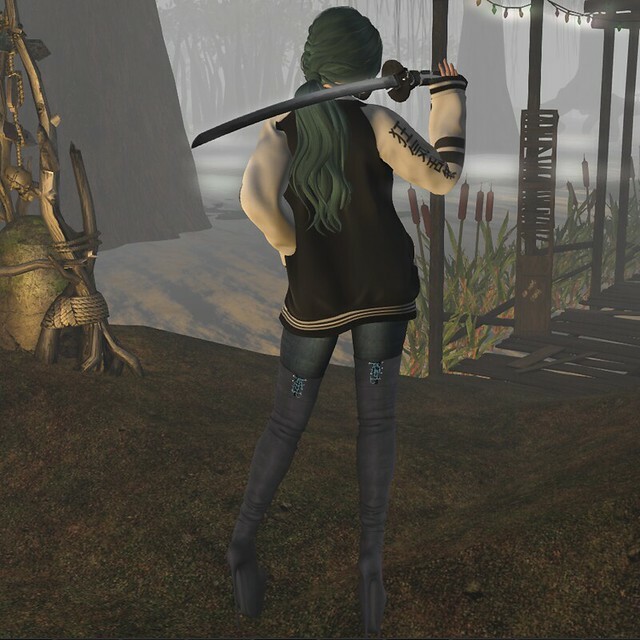 FYI, though the sweater and dress are for mesh bodies, when combined into one outfit, classic avatars can easily wear alphas from their inventory to make this look work. Here’s a closer look at the shoes. 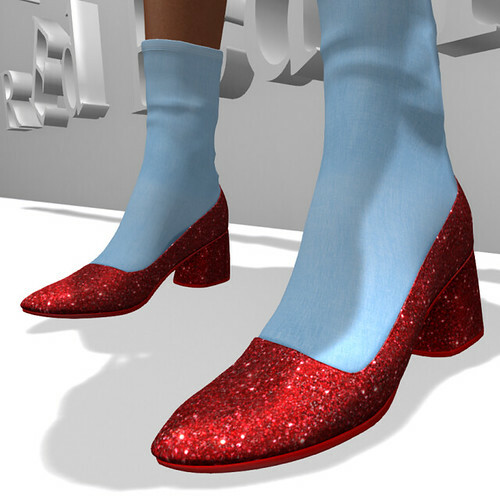 Yes, they are the spitting image of Dorothy’s ruby slippers. That alone makes them worth adding to your wardrobe. Until next time, shop happy! Let’s get to the business of plumping up your wardrobe for Valentine’s Day 2019. Today we are taking a second look at COCO Designs & Hilly Haalan’s group gifts. Their groups are free to join, and packed with goodies, so you’re bound to leave happy. Enjoy! The season of love is upon us! Currently there’s at least one Valentine’s Day hunt already underway, and many more are scheduled to start on February 1st. To celebrate the season, All Spiffed Up is going RED. I thought it would be fun to visit two of my favorite stores: COCO DESIGNS and Hilly Haalan to see just how many red outfits I could create from their current group gifts. I’m up to 4, and still have lots more combos to make. So, get ready to revel in red. Shop happy! Here’s a quick little outfit from COCO Designs to keep you lounging around the Christmas tree in style. The sweater, leggings, and slouch socks are boxed as a complete outfit perfect for quick changes. 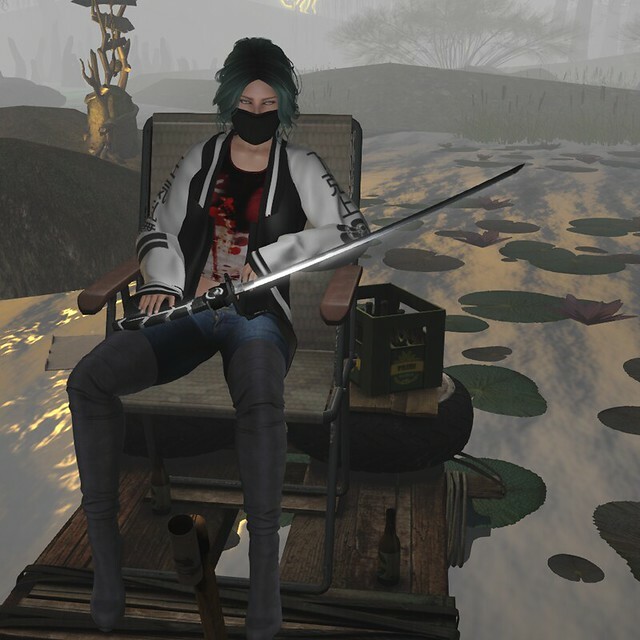 The outfit is sized for mesh bodies, however due to its head to toe coverage classic avatars can easily wear it by wearing an upper and lower body alpha. 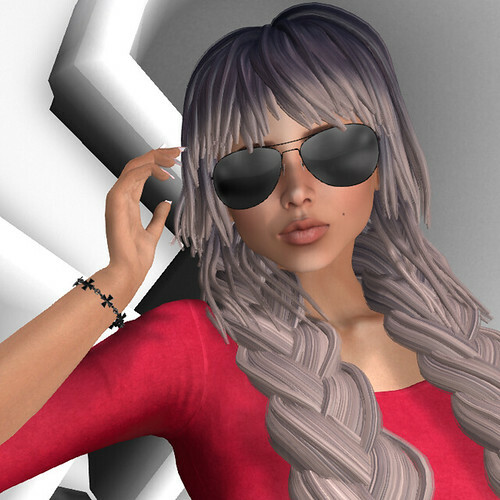 You’ll find today’s hairstyle at LARA AC along with several other free group gifts. Simply join the store’s free group and leave with a new makeover. Think Santa will notice I’m not the real thing? I hope not. That black market pixie dust cost a fortune! Seriously, this is a great gift. Gather up your friends and grab this. Put on your ice skates and flash mob a snowy sim. Take lots of pictures, they’ll leave you smiling for days. Thanks COCO Designs for a great gift. Jenny, Jenny, Jenny – all the oxiclean in the world isn’t going to get that blood out! If you find yourself suiting up for a weekend of zombie killing this bloody tank top from COCO Designs is a must have. It’s sized for Maitreya and Slink bodies only. However, other mesh bodies can often wear those tops too as evidenced by our model wearing Altamura’s free Jenny body with the Maitreya top. You can find the stadium jacket & light sword at the Gabriel booth in NEO Japan. The jacket is sized for mesh male and female bodies, and includes black tank tops as separates. Best of all, this is free for all visitors, no group join necessary. Team All Spiffed Up thought you might appreciate a matching face mask to minimize the chance of ingesting contaminated bodily fluids during a frenzied bout of slice and dice. Simply drop by the ASU headquarters to pick up your gift. We popped by the Ajuda Brasil Voluntarios sim to see if any new items had been put out. Boy are we glad we did. We found this fabulous jeans/boots combo item in the Lavinia outfit by Anastyle. Lavinia is sized for Maitreya, Belleza, and Slink mesh bodies. Today’s last stop is Born To Die for these nice mesh eyes. They come boxed with mesh plus system eyes, and an options HUD that controls size and brightness. These eyes are only one gift of several, so join the free group and reap the rewards.